It has been almost 70 years since the gospel was first preached with a view to establishing and strengthening assembly testimony in South Brazil, an area consisting of the two most southern states, Rio Grande do Sul and Santa Catarina, with a population of about 18 million souls. After so many years of consistent evangelistic labor, there are today 21 assemblies and a variety of outreaches. Presently, a number of missionary couples from Northern Ireland, along with five national evangelists and their wives, and quite a few capable local brethren do their best to carry out the Lord’s command: “Go ye into all the world, and preach the gospel to every creature” (Mark 16:15, KJV). The emphasis in the work has been, and our desire is that it will continue to be, the public preaching of the Word in a reverent and dignified manner with the power and blessing of God. 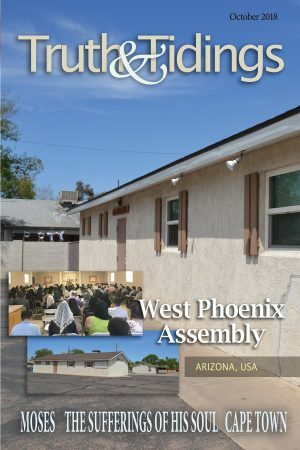 The Gospel Halls are used frequently in the onward march of the propagation of the gospel, but so are the homes of believers, rented garages, and shops. There is always a special satisfaction in the heart of the faithful preacher when he hears of the salvation of souls as a result of his labors, but sadly, the infrequency of such a pleasure in recent years is causing a lot of concern and heart searching. Over the years the missionaries have been largely responsible for the instruction and teaching of the saints. Although many of the believers are simple people, having left school earlier than they should have in order to support their families, it is gratifying to see them gladly obey the Scriptures when truth is presented to them in ministry meetings or in Bible readings. In recent years, younger believers have had the opportunity to go to higher education, with some passing through university successfully. This means that the younger generation of saints have their minds applied to studying. Our challenge today is to stimulate such saints to dedicate themselves to the study of the Word of God so that, in the future, they can share in the teaching of their fellow believers. We acknowledge that there is no substitute for the personal reading and study of the Holy Scriptures in dependency on the Holy Spirit to lead into all truth. However, thankfully, certain “tools” for the student are becoming more and more available in the native language. Due to the tireless efforts of the Watterson family in São Paulo, as well as our brother Crawford Brown in Bahia, good expositional books have been translated from English to Portuguese and published at very reasonable prices. Here in the south of Brazil, with a view to encouraging the diligent study of the Word, certain brethren take it upon themselves to publish every three months a 24-page magazine for believers, filled with suitable material for all who read it. While many saints may superficially read selected portions of this pamphlet, we believe there are those, albeit a minority, who digest all of its content. Even with these efforts that are made to stimulate and develop students of the Word, we can count on the fingers of our two hands the number of brethren who really dig into the Scriptures in order to find those rare jewels. However, with the prayers of the saints in the homelands this picture could change in the near future. This means that, for the meantime, the burden of the teaching of the saints continues to rest upon the “full-time” workers. Between series of gospel meetings there is opportunity to have a week of ministry meetings with the saints of an assembly. These are usually well attended and, frequently, one sees the believers taking notes on the teaching given. Bible readings provide yet another open door to transmit to the saints “those things which are most surely believed among us” (Luke 1:1, KJV). The questions asked, or the comments made, in such meetings give a good indication as to the understanding that particular participant has of the Word of God. The annual conferences in the south of Brazil are big days! Large numbers of saints gather on such happy occasions, not only to meet one another but, more importantly, to hear the Word of God. Such days commence with a period of prayer, followed by a two-hour Bible reading on a selected chapter of the Word. Those who are there to learn have great opportunity to do so because, usually, the chapter is expounded with a good measure of detail. Following the mid-day lunch break, there is the 2½ or 3-hour “open platform” session for the ministry of the Word as the Holy Spirit leads. Over the years this also has proved to be very profitable, as many saints have received a timely message to help them on the Christian pathway. The day closes with a gospel meeting, when a brother relates his story of conversion and another preaches the gospel. It is not rare to hear of the salvation of a soul as a result. In drawing this subject to a close, we observe that the Levitical priests had the responsibility to “teach the children of Israel all the statutes which the Lord hath spoken unto them by the hand of Moses” (Lev 10:11, KJV). They didn’t, however, devote all their time to this noble task. Perhaps nothing gave them more pleasure and satisfaction than when they had the privilege to blow the trumpet over the burnt offerings and sacrifices of peace offerings (Num 10:10). May the same be true of the workers in South Brazil. It is an honor to be able to instruct the saints in the ways of the Lord, but nothing can substitute the joy of being able to blow the trumpet over the sacrifice as the gospel is proclaimed. If we were to devote our time to teaching the saints at the cost of preaching the gospel, sooner rather than later, there would be no saints to teach. “Brethren, pray for us” (1Thes 5:25, KJV).